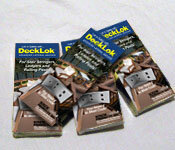 Dealer Info - Become a dealer for the DeckLok Deck Bracket System - prevent deck collapseDeckLok Deck Bracket System by Screw Products, Inc.
Find out how to become an Authorized DeckLok® Dealer today! If you are interested in becoming a dealer for DeckLok products, please give us at Screw Products, Inc. a call toll free at 1.877.844.8880. 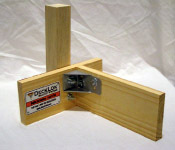 In addition to our point of purchase DeckLok Rack, we have many sales tools available to help. From floor displays to printed materials and countertop displays, we have the sales tools to help you sell! A seven box (84 bracket) display on a mini pallet. Colorful, attention-getting and loaded with our trifold brochures. These informational sheets have illustrated features on the front, and detailed installation instructions on the back. 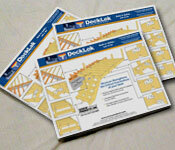 Packs of our colorful trifold brochures with detailed information about the DeckLok Deck Bracket System and RailLok.